Here at HIP Video Promo, we’ve been working hard to promote music videos since the year 2000 and have over 3,000 videos under our belt. Due to our experience and expertise in the marketing world, we have promoted some of the best musical acts of our time and inspired a shift in American radio. It’s important to give these artists a platform, and we have done that but it’s their talent that shoots them into instant stardom. Every Friday, we’ll be sharing a “Flashback Friday” video, where we get to reflect on one of our favorite videos from a few years ago. We have had the pleasure of representing one of the leaders of American heavy metal for their entire career. 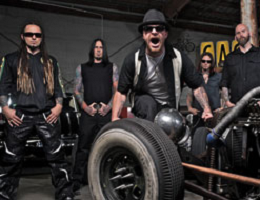 Five Finger Death Punch are a worldwide sensation, carrying their message of functioning in a world of eternal chaos, universally connecting people who feel alone in this world. Five Finger Death Punch, also known as 5FDP, came to us in 2007 to represent their video “The Bleeding.” This was only the start as we went on to promote a total of six videos from this revolutionary and vengeful group including, “Never Enough,” “Hard To See,” “Bad Company”, “Under And Over It” and the emotional “Remember Everything.” The band goes into battle with every release, putting out music that stirs emotion while also giving comfort to the listener that they are not alone in a situation that feels singular. This army was started in 2005 by guitarist Zoltan Bathory and he recruited members to the band including vocalist Ivan Moody, drummer Jeremy Spencer, and bassist Matt Snell; Jason Hook joined in 2009. Not only is the band excessively talented they have always received support from the leaders of rock and roll including Mötley Crüe, Spineshank, Machine Head and so many more. With an extreme amount of talent, it’s no wonder their 2007 debut album The Way Of The Fist charted on the Billboard 200 in its first week of release and reached the #1 position on Billboard’s New Artist/ Heatseekers chart. They are solely competing with themselves in the rock world as their debut single “The Bleeding” rose to the top ten charts and received radio airplay for eight months. The video for “The Bleeding” was voted on MTV2’s Headbangers Ball Top 5 Metal Videos of the Year. Not only did they received a large amount of success from only their debut release they sustained fight between large armed forces. Throughout their career (or should I say, mission), they have released eight studio albums complete with satanic and dark cover art to match the intensity of the band complete with strained vocals that convey the depths of their pain without having to say it. Hailing from Las Vegas they roam the desert in search of answers but realize it is a barren wasteland. Documenting their inner conflict their numbers speak for itself: their sixth album, Got Your Six, sold 114,000 albums in its first week. It was the band’s third album in a row to hit #2 on the charts; 2011’s American Capitalist debuted at #3. Hard rock bands don’t often see these kind of numbers but Five Finger Death Punch has always been an exception to the overload of roles and trends within the industry. It is their connection with soldiers that allow them to gain such a loyal fan base as they give comfort and understanding to those who suffer from Post Traumatic Stress Disorder from battle. Not only do they load their sinister videos with combat imagery, they back up their words in a myriad of ways- donating and being a source of support for veterans channeling their complicated emotions in a healthy way. Not only do they give soldiers an outlet, they also touch on topics for highly suicidal individuals with broken families as well as lives. They act as a reborn caretaker, showing the listeners that the voice inside their heads is painted with falsehood. They draw a wide audience for misunderstood teenagers as well as adults. They act as martyrs for the cause- allowing people to process their own emotions as they bleed out on their records for human display. Truly a universal and all-inclusive band- they have comforted their own demons as a sacrifice for others. Their music is classified as hard rock but it bends and extends as a cathartic experience for people who resonance with physical, mental and emotional abuse. One of their first videos that started this uprising was “The Bleeding” off their debut release. They take us on “The Wrong Side Of Heaven” as the shot focuses on the band as well as the lead singer’s abusive relationship. Their connection fades and unfolds in a destructive manner with memories folding his reality as the woman kills herself in a self-induced psychosis. As she hangs herself their fate is sealed with a love letter sealed with the kiss of death. The powerful suicidal and abusive imagery stirs deep emotion which set the tone for their long-lasting and powerful career as their videos evolved in the darkness. Since 2005, 5FDP have been certified rockers for more than a decade while still seeing impressive numbers. They have made sure to capitalize on the disruptive change- never allowing their message or their undeniable talent to fade through the cracks of a forgotten tomorrow. Despite their triggering visual content, they call for a complete reworking of one’s character so they can move on while accepting the fact that they have their demons. It is not a glorification of suicide but more of an understanding of why people commit this act. Their dark sides aren’t praised like most metal bands but are accepted and then processed. They don’t have exactly a depression or sadness over the things they have been through but more of a vengeful spirit. They want to avenge their ghost as they rewrite their stores. Five Finger Death Punch still continues to release music; they put out And Justice for None this year. As one can see by their lead single “Sham Pain”, they are here to stay to be rewarded with justice for their suffering. Rock will never die and Five Finger Death Punch is the embodiment of that statement! We’ve been big fans of Five Finger Death Punch since the beginning and shot them to their rightfully deserved stardom, and we are ecstatic to be promoting the leading rock and roll advocates for our soldiers. We can’t wait to see what diverse artist becomes the next breakout star. Do you think your video has what it takes to be the next worldwide smash hit? Get in touch with Andy Gesner and the rest of the HIP Video Promo team by giving us a call at (732)-613-1779 or emailing us at info@HIPVideoPromo.com.